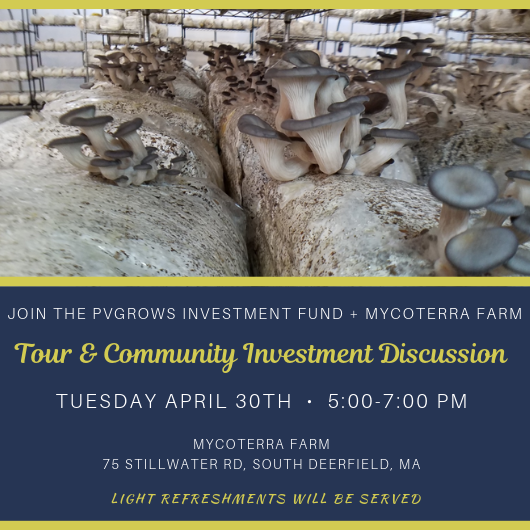 Please join us for a special evening at Mycoterra Farm where you can see the impact of community investment, meet fellow investors, and learn how to get both a financial and social return on your investment through the PVGrows Investment Fund. 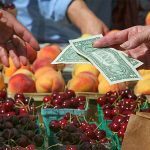 PVGIF is a community investment fund that provides loans and technical assistance to farm and local food businesses across the Pioneer Valley. You are invited for a behind-the-scenes look at owner and PVGIF borrower Julia Coffey’s stunning operation and an opportunity to learn how to align your money with your values! Community members’ investments, which start at $1,000, earn interest annually while supporting our local food system! Check out the great farm and local food borrowers who are financed by these community investments. We hope you can make it! Please RSVP here. 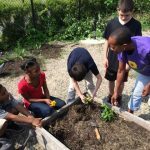 PVGrows is a collaborative network dedicated to enhancing the ecological and economic sustainability and vitality of the Pioneer Valley food system.